Enterococci are the most common pathogens of nosocomial urinary tract infections, infections in the area of dialysis shunts, as well as wound infections and endocarditis. Enterococci are Gram-positive lactic acid bacteria which play an important role in the environment, in humans and animals, as well as in the food industry. Nonetheless, certain enterococci strains, such as E. faecalis and E. faecium, are increasingly becoming more important, particularly in the case of persons with weakened immune systems. Enterococci are intrinsically resistant to many antibiotics (including cephalosporins, quinolones, clindamycin). In addition, they can easily acquire additional resistances. Because of a lack of therapeutic alternatives, the increasing appearance of vancomycin-resistant enterococci (VRE) for short, is particularly worrisome. Therapeutic alternatives for antibiotic treatment are, however, still insufficient. Therefore, rapid typing of resistances that appear, as well as enterococci differentiation, is of major therapeutic and epidemiological significance. Conventional methods can only detect the phenotypical characteristics of the resistance and not, however, the genetic background. In addition, they are very time-consuming, with a reliable diagnosis being determined only after 2-5 days. The use of our GenoType Enterococcus, in contrast, allows you to have a rapid and reliable enterococci diagnosis. 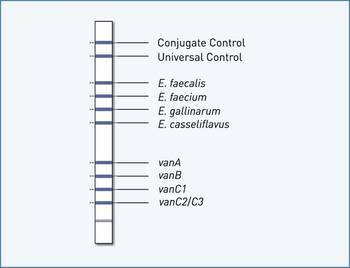 Through simultaneous species differentiation and determination of resistance, the types E. faecalis, E. faecium, E. casseliflavus and E. gallinarum can be differentiated, as well as any vancomycin resistance (vanA, vanB, vanC1 and vanC2/C3) demonstrated. Thus our test system is not only a reliable method of detection, but also saves essential time in enterococci diagnostics. 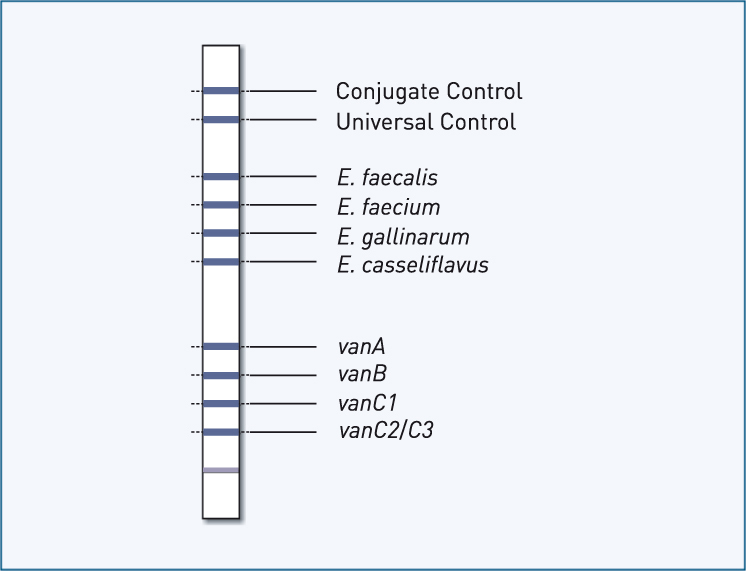 High sensitivity and specificity: the differentiation of E. faecalis, E. faecium, E. casseliflavus and E. gallinarum as well as determination of vancomycin resistance enables you to have efficient enterococci diagnostics. Time-saving: GenoType Enterococcus enables simultaneous species differentiation and resistance determination within 21 hours and thus saves a considerable amount of time as compared to conventional methods. Cost-effective: no cost-intensive instrumentation is needed to perform testing; therefore an economical set-up is possible for smaller laboratories.